Google doesnt have physical locations to perform service on its devices like Apple has Apple Stores all over the US. Googles warranty service website has recently been updated with referenced to an in-house Repair Center where Google will officially be performing repairs. After all, Google should be taking care of its own MadeByGoogle hardware. Mail-in repairs could take anywhere from 7-10 business days after shipping your device to the Repair Center. Currently, the Pixel, Pixel XL, Pixel 2, or Pixel 2 XL are all supported. If you have a Pixel Book, youll have to take it into a uBreakiFix but wed assume that Google will begin supporting its computers at some point. 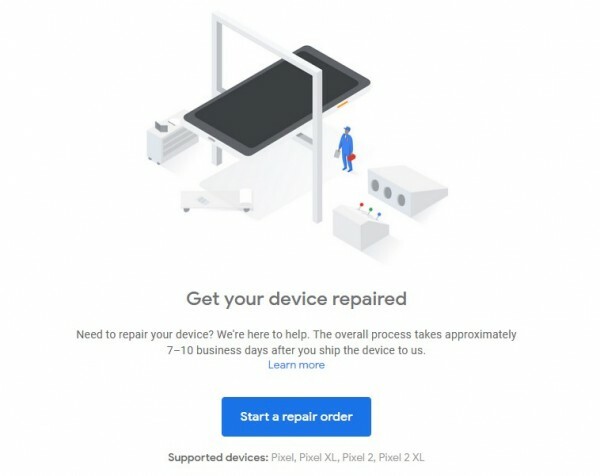 If you have any Pixel smartphone, you can go to the Google Store repair page and click Start a repair order. You should backup your phones data before sending it in as Google will wipe all its contents before returning it to you. The same page also offers a few quick-troubleshooting tips to try before starting a repair order. A Pixel 2XL costs $239 to repair a cracked screen out of warranty. If the phone has internal water damage, it will cost you $413, just to give you an idea about pricing.